Bill Murray, a misanthropic big city news reporter, travels to a quaint town to report on the groundhog’s predictions for spring. He finds himself waking again and again to the same day and, after nearly succumbing to the monotony of this predicament, he instead realizes his opportunity to make this one day as wonderful as possible. This Groundhog’s Day, why not put your own efforts into creating a day as special as possible. Fresh flowers are the perfect way to add a little beauty and appreciation into any day and a great choice for this February 2nd is gayfeather. Known by the Latin name, Liatris, or sometimes called blazing star, gayfeather flowers are the perfect symbol of a perfect day. Elegant and regal, the bright purple blooms of gayfeather line a stem as straight as a table leg and most stand just about as tall. 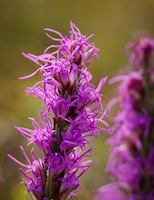 This flower is native to North America where it blooms in meadow and prairies in full sun. A strange cousin of the sunflower family, the tiny purple buds that line the stem from top to bottom resemble small, petal-less daisies and are a favorite of butterflies and florists. Both love the straight stalks, perfect for perching or for adding height and form to flower arrangements. Alone in a vase by themselves, the simple beauty of gayfeather will be a reminder of nature’s perfection. Mixed in with other flowers of the field such as yarrow or daisies, they will be a focal point for a day lived to its fullest. In the Victorian language of flowers, the gayfeather is said to symbolize gaiety. This simple word is synonymous with such feelings as merriment and joyfulness- a rarity in most 9 to 5 days- but ones that should occupy more of our time than we probably allow. There are several different species and cultivars of gayfeather grown as both a cut flower and a garden plant. 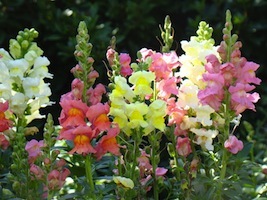 A perennial in landscapes, this flower typically blooms in mid-summer and lasts for weeks. Popular year round, you can find this flower in almost any flower shop. Ranging in hue from deep purple to the lightest lavenders, they are easy on the eye and easy on the wallet at under a dollar a stem this time of year. In a vase of fresh water, you can expect them to last at least 2 weeks without loosing color- just in case it takes you, like Bill Murray, several attempts to make the day as perfect as possible.